Clemson, SC – Clemson heard the noise about slow starts and answered with a resounding, “no more”. The only slow start for the Tigers on Homecoming weekend was a longer-than-normal pause at the top of the hill before the cannon fired. NC State elected to receive the ball to start the second half and Clemson put together one of the most consistent and drives of the Tiger’s 2018 season. No plays went for negative yards and Clemson scored with yet another Etienne touchdown just three minutes into the game. NC State responded with a three and out capped off by a doomed slip screen pass on third-and-19. Both teams traded uninspiring drives plagued with different problems. Clemson’s problems were of execution – two drops forced the Tigers to punt. NC State’s drive ended with yet another questionable coaching decision. In a third-and-1 situation, they utilized a heavy formation and ran the ball against Clemson’s stifling run defense on the outnumbered side with no disguises. The play predictably ended with a loss of two yards and the Wolfpack punted. 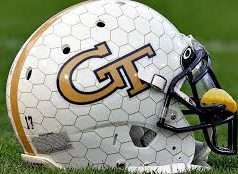 After several overthrown deep passes by Trevor Lawrence, he connected with Tee Higgins for a 46-yard touchdown on a deep crossing route to make the score 14-0. The next drive’s problems were an excellent summary of NC State’s problems. Ryan Finley placed an absolute dime on a fly route to Kelvin Harmon on a play action pass. Harmon dropped what would have been a sure touchdown in a game where yards are hard to come by. After two procedural penalties pushed the Wolfpack back to a third-and-21 situation on the same drive, Gallaspy surprisingly gained 20 yards on a draw play. Dave Doeren inexplicably elected to punt with one yard to go on fourth down – another decision that analytics does not support in a game where the Wolfpack needed to take advantage of every opportunity. The first quarter ended with Clemson holding on to a 14-0 lead. In the middle of the second quarter, the Tigers’ thirteen play, 64-yard drive stalled on fourth-and-1 just inside the red zone. 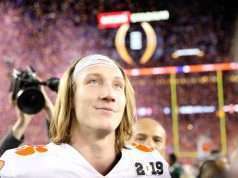 Clemson faced a choice, and they made the right one. Clemson went for the first down but used a fake field goal that failed on a double-fumble mishap with a low snap. If NC State had an opportunity to get back in the game, the next drive was the golden moment. For a moment, Ryan Finley and company would make this a game – seven plays totaling over 35 yards moved the Wolfpack into Tiger territory. On third and seven, a team fumble on an apparent passing play was recovered by Dexter Lawrence near midfield. The Tigers had their second chance – and this time they weren’t going to waste a gift. Lawrence accounted for (passing and running) 50 of the 54 yards on Clemson’s third scoring drive of the day, and Travis Etienne punched the ball in with less than a minute in the half. If NC State could score before halftime and score after halftime, they would be back in the game with a manageable single digit deficit. While execution and coaching are a part of football games, sometimes luck has its say. On Ryan Finley’s second pass of the drive, the ball was tipped and intercepted by K’Von Wallace. Clemson’s inspired return by Wallace and blocking by his teammates got the Tigers just short of a touchdown. With four yards to go and equipped with four downs and two timeouts, the Tigers were poised to put the game out of practical reach. Clemson was determined to attack the perimeter and NC State held strong. Three combined timeouts, two Clemson penalties, and seventeen seconds later, Greg Huegel kicked a 28-yard chip shot field goal to extend Clemson’s lead to 24-0 at the end of the half. NC State pieced together a seven play, 45-yard drive and were poised to score their first points of the game. In an already lackluster game for Ryan Finley, his interception to senior linebacker Jalen Williams near the end zone was another miscue in what was already a worst case scenario for NC State. Each team traded drives twice as the grind of the second half continued and action finally picked up again at the end of NC State’s second drive. With seven yards to go on fourth down, the Wolfpack executed a fake punt inside their own 30-yard line. It was too little, too late, and poorly executed. 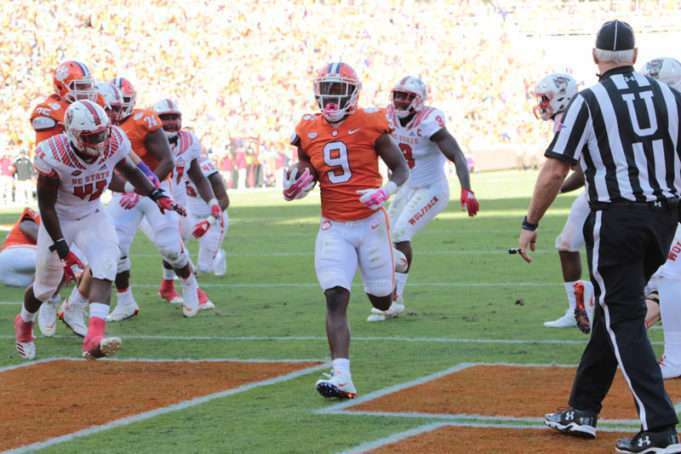 The 22-yard drive ended in Etienne’s third rushing touchdown of the day – the first time a Clemson player scored three consecutive touchdowns in three consecutive games. If there was any doubt about the outcome before, the 31-0 lead with less than four minutes left in the third quarter sealed all doubt. Even if NC State’s fate was sealed, they still managed to score at the beginning of the fourth quarter on a ten play, 75 yard, four-minute drive and deny Clemson its first shutout of the year (they were shut out in Death Valley in 2014). Kyle Bambard’s kickoff traveled just fifteen yards to midfield where Nolan Turner recovered the ball. This was on the week where ESPN’s segment about teammates Coach Swinney and his deceased father Kevin Turner was aired. Lawrence and Etienne led the Tigers all the way to the nine-yard line before the drive stalled, and thus Greg Huegel kicked his fiftieth field goal for Clemson to make the score 34-7 with 12:32 left in the game. After a State three-and-out, the Tigers backups finished out the game to the tune of “We Will Rock You” by Queen. Showing no signs of slowing down, Chase Brice threw two 24-yard strikes on Clemson’s 84-yard scoring drive that was capped by a Lyn-J Dixon rushing touchdown (score 41-7, 8:11 left). Alex Spence missed a 36-yard field goal with three minutes left in the game. Almost every question about the game and who performed better can be answered with “Clemson” or whomever the specific Clemson player is. NC State barely topped 100 yards rushing (with five rushers), and Ryan Finley completed 21-of-34 passes for 156 yards and two interceptions. In what was considered to be a resume game for Finley, he failed to even help the Wolfpack make it a close game. Trayvon Mullen and company held Kelvin Harmon to two catches for thirteen yards (he also dropped a sure fire touchdown). His sidekick Jakobi Meyers had eight catches for 61 yards – the only State player to have more than 30 receiving yards or two catches. NC State loaded the box to force Trevor Lawrence to throw, and he responded by completing 26 of his 39 passes for 308 yards and a score in one of his best performances in a Clemson uniform so far. Etienne ended his day with three scores on just fifteen attempts for 39 yards – a reflection of NC State’s selling out to stop the run. Clemson had seven rushers for just under 100 yards and four scores as they passed to get down the field and rushed to punch the ball in for points.